Coding in schools may be a trend, but it’s a necessary trend that, judging from the most recent State of the Union Address, is here to stay. 90% of Americans and 100% of politicians agree on the importance of teaching computer science. Some states, including Arkansas, Hawaii and Delaware, have already taken the lead in making computer science education available to all students. The Computer Science Education Coalition is urging congress to provide 250 million dollars in federal funding for K – 12 computer science education. If you need more convincing, just check out these stats. But learning to code is about more than preparing kids to have meaningful careers. If you’re interested in bringing coding to your school, you already understand the value. But some teachers and parents might not. Helping the school community understand the value of a computer science program is crucial. And this one. And this one. All teachers, regardless of their technical skills, have something to contribute. Drawing on everyone’s creativity, knowledge and ideas will strengthen your technology program, build confidence, and take away fear. Tip: Don’t force teachers to teach code. Rather, help them incorporate coding concepts into their lessons, even without technology. Creating a school wide computer science program seems like a daunting amount of organization. But if you go slowly and step-by-step, it’s doable. A blog is a great way to keep everything organized. If you don’t know how to set up a blog, you’ll surely find somebody in your school who can help you – maybe even a student. Having a blog post for each coding class session, with the plan for the day, embedded images and videos, and all the necessary links helps classes run smoothly. Create a category for each class or group of students. Write posts in “pseudocode” so children can get used to seeing common coding symbols and formatting. Besides lesson plans, include pages with information for parents, rules, and photos (which can be password protected). Having a page of links students can visit if they’re waiting for help keeps kids from getting antsy and frustrated. Adding a “project gallery” page is a fun way for students to show off their projects. Include widgets with vocabulary words, links the students need often, etc. Create bookmarks, or better yet, set browsers to open directly to the blog. Encourage families to visit the blog regularly. Coding, for better or worse, is most often associated with STEM or STEAM. But, with all the critical thinking and problem solving involved, coding can go so much farther than that, without taking time away from other subject areas. In fact, incorporating coding into all subject areas will actually help teachers cover Common Core and other sets of Standards. 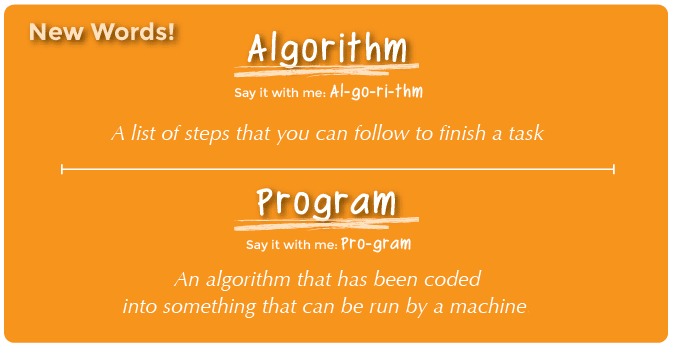 Computer science concepts should be taught in every single classroom, from preschool on up. There’s no need to reinvent the wheel. Start with this easy to follow curriculum from code.org as a springboard, and then supplement with other subjects wherever you can. Get teachers of all subjects to “talk like a techie” and before you know it, math class won’t be the only place students are using words like “variable.” You might even hear them using words like “antagonist” and “protagonist” on the playground. Tip: Let students design their own vocabulary flashcards with PhotoShop or an online tool like Canva or PicMonkey. Little kids should should be singing, making friends, learning how to cooperate with others, and playing in the dirt. Kids need to play. Which means that they shouldn’t be spending time learning to code. Don’t forget. Coding is play. So get your dice, decks of cards, and markers ready. Tip: The studio.code.org curriculum has unplugged activities from Thinkersmith built in. For younger kids, try some of the activities from Hello Ruby. Make sure the students understand that two, three, or even four heads are better than one. The last thing you want to see is one kid clicking away while another sits there bored, doing nothing. Tip: Make signs (or have kids make signs) with the do’s and don’ts of pair programming to put up near school computers. Coding clubs during lunch or afterschool, where students can come and work on whatever projects they’d like in a relaxed environment, give students the opportunity to teach each other and themselves and make more strides with coding. Once a core group of coders is established, the school will have a group of kids who are able to help run your school’s computer science program. Tip: Encourage teachers and administrators to come to coding club meetings and work on tutorials and projects so the children have a chance to watch adults learn. Even teachers who have never written a single line of code can teach computer science. The idea is to learn along with the kids and expose them to new ideas. Stuck in the middle of a lesson? Don’t worry. That’s absolutely okay. All programmers need to look things up and debug. There’s no reason students and teachers shouldn’t learn how to solve problems together. It’s very likely that some students will get to a point where they they know more than their teachers. And that’s okay too. Learn from them, keep them on track, and teach them how to teach themselves. Tip: Just because it’s okay for kids to surpass the adults, adults should keep learning. Organize regular professional development that can be led by volunteers from your school or outside trainers. Codecademy and W3 Schools are great tools for self-paced professional development. Coding is fun, so many children are hooked from the start. But that doesn’t mean they shouldn’t understand why they’re learning to code. Let them learn from Mark Zuckerberg and Bill Gates, but also teach them about the very first programmers like Ada Lovelace, Grace Hopper, and Betty Holberton. You’ll find plenty of inspirational resources here. Take advantage of this kind of example of coding in the “real world.” Let students see that all-star basketball players and models are learning to code. Tip: Ask students to create videos and images with their own quotes about the importance of code. Invite families to events where students present their coding projects. Kids can take ownership of the events by making invitations and helping with the planning and preparation. Tip: Make certificates to present to the children in front of their families. Personalize the certificates with photos, stickers, and a note on the back, and let the kids decorate them. Once your school’s technology program has a strong social media presence and a blog (even a new, temporarily empty) blog, wrap everything up with an email signature. Tip: There’s no need to include all the features you see in the example above. Ask parents which parts of your school’s signature they interact with most and adapt your signature as time goes on. We teach kids writing, even if they don’t plan to become writers. We teach kids biology, even if their future careers have nothing to do with science. We teach kids music, even if they never play an instrument as an adult. We teach these subjects to make the next generation of adults capable, well-rounded and educated. There you have it. Follow these ten steps, and help the students in your school prepare for the future. Does your school have a computer science program? What has worked for you? Leave a comment and share your expertise.